There are lots of ways to get ahold of us. See Sherpa in action! Book a call with our sales team to see how Sherpa can help you today. Learn about your Sherpa system. Find software releases articles, webinars, training videos, FAQs, and more! Having an issue? Submit a ticket to our support team—they are ready to help! 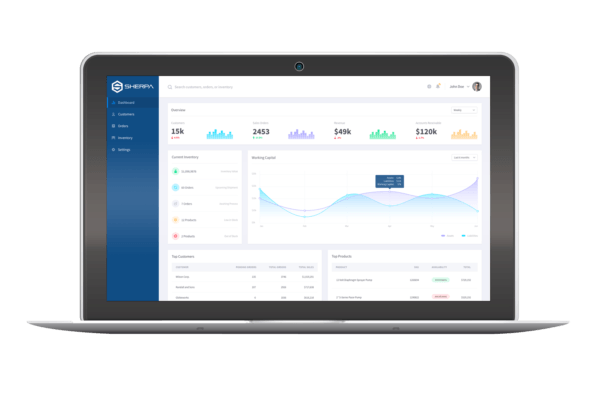 Let us show you how Sherpa can help to ditch the spreadsheets and manual processes slowing you down, so you can focus on growing your business. For snail mail, driving directions, or just in case you want to say hi, our mailing address is below. If you can’t find what you’re looking for, drop us a line. We don’t mind. Email us using the form above ^. No pressure. Demos are 100% free no obligations necessary. What accounting systems does Sherpa support? We can integrate with the most common accounting software out there. Quickbooks, Sage, and much more! Wondering if Sherpa will work with what you are using? Just ask. How much does Sherpa cost? Though we’d love to share our pricing on our site, unfortunately, pricing is totally dependent on a business’s specific needs. If you want a quote, just give us a shout!